Four Eckerd College students received the National Oceanic and Atmospheric Administration (NOAA) Hollings Scholarship this spring—bringing the school’s total to 66 recipients, still the most in the nation. 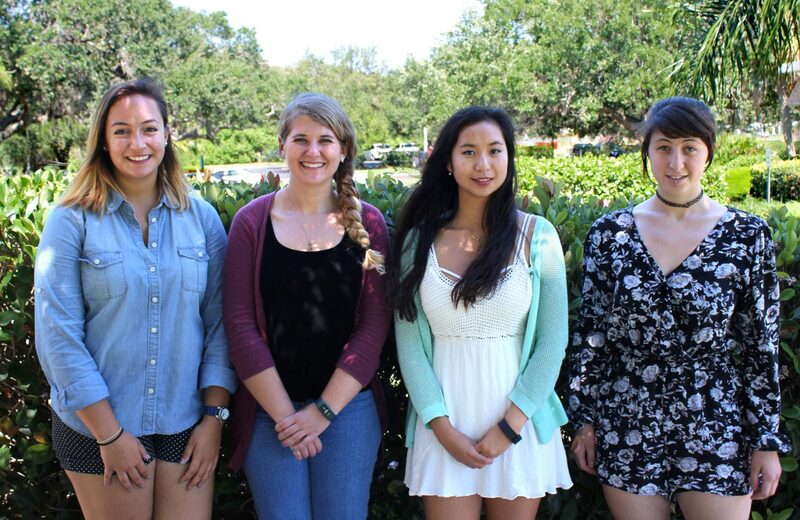 (From left to right) Eckerd College sophomores Jessica Heckman, Emily Colson, Lucy Fitzgerald and Abigail Thomas were awarded the 2016 NOAA Hollings Scholarship. Sophomores Emily Colson, Lucy Fitzgerald, Jessica Heckman and Abigail Thomas each earned a $9,500 scholarship for both their junior and senior years and a $700-per-week internship to take place the summer after their junior years at a NOAA facility. Thomas, who used Eckerd’s Create Your Own Major program to focus on environmental science and design, said she had been confident she would be a Hollings Scholar ever since she learned about the program her freshman year. Scholarship applicants were required to submit an essay along with their academic credentials, and all three of our winners majoring in marine science wrote about their relationships with the ocean. “I wrote about how I’ve done research in the past with [Eckerd professor] Dr. Gregg Brooks and that NOAA would be the next step in my research career,” said Heckman, of Lincroft, N.J., who also majors in biology. Students were on Spring Break when the scholarship winners were announced in March. This summer, Fitzgerald will head off to Woods Hole, Mass., to do a Research Experience for Undergraduates Internship from the National Science Foundation. All four winners said they were extremely excited about joining Eckerd’s growing list of Hollings Scholars. Colson, a member of the Eckerd College Search and Rescue team from Fishers, Ind., said she believes the scholarship will be an important stepping stone on her career path. “I’m excited about what doors and opportunities this will open,” she said.